Though the price makes you wince, you might just buy that bottle of your favorite olive oil anyway. Perhaps it's exactly what you want for the salad dressing you're making tonight and for your special stir-fry on the weekend. But are you really getting what you paid for? 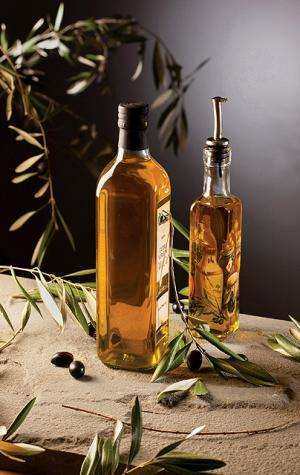 A bottle proclaiming that it is olive oil might actually include another, less-expensive vegetable oil derived from, for example, safflower or canola. Mislabeling is of concern not just to shoppers, retailers, and chefs, but also to America's olive growers, olive oil processors, and more—especially those newly entering the U.S. olive oil market. California, which already produces the bulk of the nation's olives, is experiencing a resurgence of interest in producing more of this popular vegetable oil, even in the face of significant international competition: Today, about 98 percent of all olive oil consumed in the United States is imported. Scientists at the Agricultural Research Service's Western Regional Research Center in Albany, California, are contributing research findings that may strengthen the domestic olive oil industry. Talwinder Kahlon and Ken (Jiann-Tsyh) Lin, for instance, have developed analytical methods that can be used to assure the authenticity of olive oil. Rebecca Milczarek is investigating opportunities for making better use of the olive-milling byproducts that are left once the plump fruit, or "drupe," has been processed to extract its oil. Mendel Friedman and colleagues have shown the effectiveness of olive powder for a perhaps surprising task: keeping hamburger patties safe to eat. With further work, the procedure could perhaps be used to identify other vegetable oils, such as avocado, hazelnut, soybean, or walnut, that are sometimes added to incorrectly labeled olive oil. The idea of using PCR technology to detect specific plant DNA in olive oil is not new. But Kahlon and colleagues say their approach offers several improvements over other PCR-based assays. For one thing, their process relies on analyzing plastid DNA. The double layer of membranes in which this DNA is encased may protect it from damage that might otherwise skew test results, Kahlon says. Olives of various shapes, sizes, and colors. ARS scientists are helping to discover the secrets of a crop that is a lot more than just delicious. Once the oil is extracted, even the byproducts, or leftovers, have significant potential value to consumers. Credit: University of California-Davis Olive Center. Another advantage: The olive, sunflower, and canola "DNA barcodes" that the team developed—to serve as the basis for comparing these plants' DNA—are based on not just a single olive tree or a particular sunflower or canola plant. Instead, each barcode is a broadly representative composite, referred to as "consensus DNA." The olive barcodes, for example, are representative of olive DNA from commercially grown olives and bottled olive oil, as well as from olive DNA sequences posted at an international online database maintained by the National Center for Biotechnology Information. Kahlon and coinvestigators Shashi Kumar, formerly at Albany and now with the International Center for Genetic Engineering and Biotechnology, New Delhi, India; and Sanika Chaudhary, formerly at the University of California-San Francisco, documented their research in a 2011 article in the scientific journal Food Chemistry and are seeking a patent for the assay. The assay that chemist Talwinder Kahlon and coinvestigators developed relies on PCR (polymerase chain reaction) technology to compare olive DNA to that of two other kinds of plants—canola and sunflower. Oil from these plants is sometimes mixed with olive oil. The test focuses on key regions of two genes, matK and psbA-trnH, that occur widely throughout nature—including in olive, canola, sunflower, safflower, and other everyday sources of edible vegetable oil. The research team has shown that the DNA sequence of specific regions of these two genes provides a reliable basis of comparison and can be used to quickly detect the presence of the non-olive oils in an "olive oil" sample. The assay can identify the three oils at concentrations of 5 percent or higher. The test requires only about one-fifth teaspoon of an oil sample. And, from start to finish, including various sample-preparation steps, the test takes only about 2 to 2-1/2 hours to conduct. What's more, it is comparatively inexpensive and requires only the equipment and supplies that most DNA labs already have on hand. Olive oil is made up of triglycerides—molecules composed of three fats (technically, fatty acids). These fatty acids are the focus of another approach to detecting oils in olive oil that might not be listed on the label. Each of the three fatty acids in a triglyceride is attached to what scientists describe as a "glycerol backbone," explains chemist Ken Lin. The bonds occur along the backbone at specific positions. For every type of triglyceride, the three fatty acids bond to glycerol in specific patterns. 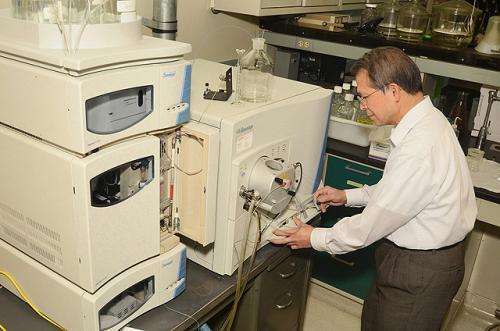 The technology that Lin uses, ESI-MS (electrospray ionization mass spectrometry), enables scientists to glean details about variations in specific triglycerides of interest, referred to as "regioisomers." From that, the scientists can develop ratios of regioisomers that can be used to determine whether the sample contains any oil other than that extracted from olives. The value of ESI-MS for analyzing plant fatty acids and animal fats has been recognized since at least 1994. But Lin's ESI-MS protocol helps make this application simpler. Lin developed the protocol for use in his research with castor, a plant that produces an inedible, top-quality industrial oil. Olive oil came into the picture only tangentially: About 6 years ago, Lin chose it as a model for testing the assay. Lin has described the ESI-MS assay in scientific articles that appeared in the Journal of Agricultural and Food Chemistry in 2008, the Journal of the American Oil Chemists Society (AOCS) in 2012, and in a 2010 addition to the AOCS Lipid Library, a reference maintained online for use by researchers worldwide. 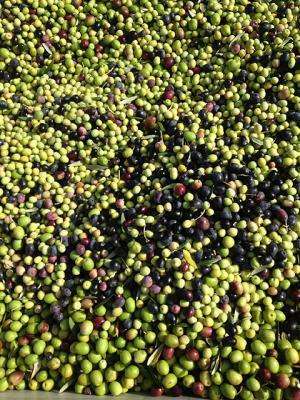 Right now, most olive milling leftovers—skins, pulp, and pits—typically have only low-value uses. The two-phase process commonly used in the United States for olive milling produces these leftovers, referred to as "pomace." This wet, heavy goulash ranges in color from green to brown to black to purple, depending upon how ripe the olives were when they were harvested. Pomace has an aroma somewhat like that of olive tapenade—a flavorful spread made of finely chopped or pureed olives, anchovies, capers, garlic, and olive oil. "Mills produce about 38 pounds of pomace for every gallon of olive oil produced, so they are always facing the problem of what to do with it," says agricultural engineer Rebecca Milczarek. "Some olive mill operators pay to have the pomace shipped to sites where it dries outdoors for a number of weeks, and then it's sold as a cattle-feed ingredient." Milczarek says one key to creating innovative, environmentally friendly, higher value uses for olive pomace is to develop techniques that millers can use to quickly and affordably dry it on-site. Drying significantly reduces the weight of the pomace, making it cheaper and easier to ship. Small mills could ship their dried pomace to a centralized processing plant where, for instance, additional oil, or compounds for use in new foods, pharmaceuticals, cosmetics, or other products, might be extracted. "Most small mills can't afford to buy their own extraction equipment," notes Milczarek, who began working with California olive growers and olive oil processors in 2010. According to Milczarek, pomace typically is about 65 percent moisture—a level that would need to be lowered to about 10 percent before shipping the pomace to a processing plant. Once there, the pomace may require more drying, depending upon what component is being extracted. Milczarek is investigating the dynamics of drying pomace to determine precisely how long it takes to dry. "To give an olive mill owner a science-based answer to that question," she says, "you need to know the 'diffusion coefficient' of water from the pomace. The coefficient depends on pomace characteristics and the drying system used. The higher the coefficient, the faster the rate at which it loses water and, theoretically, the less money you might have to spend drying it." In preliminary experiments, Milczarek processed—in batches—about 12 pounds of fresh pomace, using a combination of microwave and convection (hot forced air) drying. The study is likely the first to take into account the fact that the pomace shrinks during drying. It may also be the first to keep the internal temperature of the pomace steady. "These two aspects of our study helped us get more accurate values than those that have been reported in earlier work," Milczarek explains. "Our coefficients for the four internal temperatures that we used—104°, 122°, 140°, and 158°F—average about 28 percent lower than those published in previous studies, meaning that drying times may be longer than what earlier data had indicated. "Longer drying times could affect the configuration of your drying system. In a commercial setup, the magnetrons that generate microwaves, and the heater and fan unit for convection drying, would be positioned in a drying tunnel that has a conveyor belt running through it. You may need a longer tunnel and may need to operate the conveyer belt at slower speeds so that the pomace will be sufficiently dry when it comes out of the tunnel. "Longer drying times also add to energy costs. Nevertheless, the combination of convection and microwave drying is inherently more energy efficient than drying options that are based solely on convection." Milczarek collaborated in the research with Tara H. McHugh, leader of the Processed Foods Research Unit at Albany, to which Milczarek belongs; Annie A. Dai of the University of California-Davis; and Caio C. Otoni of Brazil's Federal University of Viçosa. Their 2011 article in the Journal of Food Engineering has details. Olive powder for safer burgers? The potential of olive powder to keep foods safe to eat is getting a fresh look from Albany chemist Mendel Friedman and colleagues at the University of Arizona-Tucson. An olive processing coproduct, olive powder was one of about two dozen plant extracts, spices, and herbs that the team evaluated for their potential to combat Escherichia coli O157:H7 and to retard formation of heterocyclic amines during cooking of hamburger patties. E. coli O157:H7 is a leading cause of food sickness in the United States and is blamed for more than 73,000 cases of illness annually. In recent years, many E. coli outbreaks have been traced back to ground beef and have led to the introduction of stringent new food safety rules designed to reduce the occurrence of this microbe, and six of its relatives, in meats, poultry, and other foods. Heterocyclic amines are of concern because they can inadvertently be formed when beef patties are cooked to the doneness recommended for helping kill unwanted microbes, such as E. coli. The two amines monitored in the burger experiment, MeIQx and PhIP, are on the National Toxicology Program's roster of possible carcinogens. For the study, high levels of E. coli O157:H7, along with the plant extract, spice, or herb of interest, were added to the ground beef patties. The patties were then cooked on a griddle until the meat's internal temperature reached 114°F, then flipped and cooked another 5 minutes until the internal temperature reached the recommended 160°F. The amine data showed that olive powder reduced MeIQx by about 80 percent and PhIP by 84 percent. Overall, olive powder was the most effective of the plant extracts (olive, apple, and onion powders) that were tested. Friedman notes that followup studies are needed to pinpoint the compounds in olive powder that are responsible for these effects and to determine whether the amount added in the experiments alters the burgers' taste. The ability of olive extracts to kill foodborne pathogens has been reported in earlier studies conducted at Albany, Tucson, and elsewhere. However, the E. coli and amines study, reported in a 2012 issue of the Journal of Agricultural and Food Chemistry, may be the first to show olive powder's performance in concurrently suppressing three targets of concern—two major amines and a pervasive E. coli. "Olives! 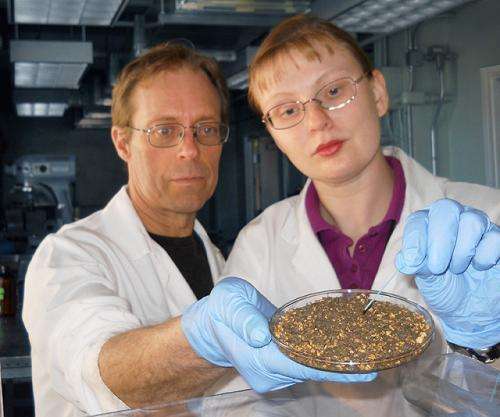 Scientists Take a New Look at an Ancient Crop" was published in the May/June 2013 issue of Agricultural Research magazine.